The recent furor over the burial of Ferdinand Marcos in the Libingan ng Mga Bayani again revealed the tendencies of the Filipino when butthurt, offended or otherwise faced with something they are unwilling to accept. Many went on the streets decrying this burial. Of course, they have the right to protest. However, it seemed only the latest outrage for outrage faddists. Also, the kind of anger and fervor they displayed might have been fueled by a wrong attitude that I believe is the root cause of conflict in the world. As I have said in my personal blog post, there are people who believe that they should be in control of the world. But it does not have to manifest in directly wanting to control others. It’s not only in the political or religious arena. It can manifest in personal and social relationships. It can go something like, “My way is right. It is the only path to goodness. It will save the world. So I want the whole world to follow it.” It’s made worse when people have emotional dependence on this. So if they don’t get their way with the world, they get depressed or angry. So what’s wrong with this? Well, Hitler, Pol Pot and Stalin also believed they were saving the world. But we know where that went. Some people may feel outrage at being compared to these historic dictators and murderers. But people should see that these dictators were control freaks. Beautiful-world-according-to-my-view-of-it faddists, you might say. They wanted to mold the world according their brand of good. I once said before, there’s a Hitler sleeping in each and every one of us. That’s how I see Bratty Conyo Idealism. One of the greatest myths we have about our human relationships is that we should be the same, believe the same and act the same. However, that will mean we are no longer human, but automatons. Difference in thought and action is necessary as proof that we are free beings. Yet it seems some people cannot accept that others are free. They may see others’ freedom as threats to their own concept of good and beautiful. It even goes as far as fearing something opposing or offensive in someone else’s personal life. This is what gives even ordinary people great potential to become dictators and cruel people. 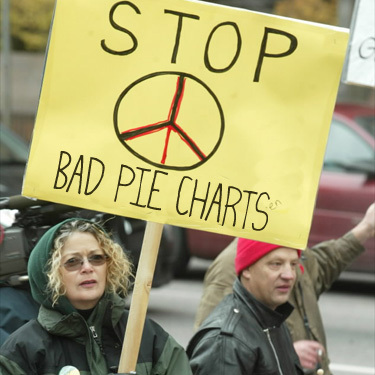 Even people with supposedly well-meaning intentions, such as wanting to make the world beautiful, good, pure or nice according to their view of it, may actually be doing harm. How do you know your view of what is good is really good? For example, we in the western orientation consider arranged marriages in other cultures as wrong. But when you look at it from the society’s point of view, they will say letting children chose their own partners is wrong and defend arranged marriages as a necessity for survival and perpetuation of tradition. Or I’ll reuse the example of an LGBT “advocate” who wants to force a person who said, “I’m not really comfortable with gays” to recant it and say the opposite. Trying to get someone to recant his “annoying” opinion seems megalomaniac to me. Also, this meme recently came out. The problem we have about our behavior towards other people is that if the other person bears reprehensible beliefs, we believe we have the right to be angry at them or attack them. So we would insult or call for authority to clamp down on these people. We would believe being friends with them is wrong. So what if you see people whose beliefs you don’t want to respect? Still, respect them. That is exactly what tolerance is all about and that is how unnecessary conflict is avoided. 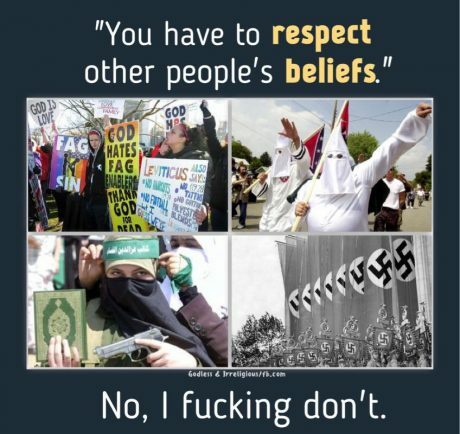 You may not respect their beliefs, but you respect them as persons. This is difficult, of course. But for me, Daryl Davis still respected them, and that allowed him to win the hearts of certain Ku Klux Klan members, leading to them making changes in their beliefs on their own. Well, then I’ll also say you’ll have to respect their beliefs, too, or at least, their right to have these. People come to their own conclusions, reprehensible as they may be, in their own way, and if those conclusions shock you, sometimes, you will need to accept it. People have their own experiences apart from yours. That is something I have come to realize throughout my blogging experience and throughout life. There is also the element of fear. What we fear about the people in the meme is their actions. We develop a fear about some members of the above doing violence. So useless insults and disrespect fly, especially online, against people we fear who are about to do violence. However, perhaps we should let go of this fear, as Daryl Davis did, lest we become fear faddists. Of course, some people from these groups have taken violent action. But is it really because of their beliefs or because of something else? Based on Daryl Davis’ experience, it could be something else. Some people are sad when they know that other people actually admire Marcos, and get angry when they are told that there’s nothing they could do to change these thoughts in other people. They might be indignant when told to accept it. But that’s it – sometimes, you have to accept that something in the world will never follow you. Indeed, isn’t one of the greatest pieces of advice in relationships is that you can’t change other people? So the world is cruel. People are cruel. But one would wonder: are you also cruel yourself but just denying it? And, of course, as I said in yet another article, don’t ever let this become the reason for your lack of happiness. The above was a tentative title for another article, but I decided it’s a good highlight for this part. Indeed, here is where the hubris of humanity is expressed. “I own the world.” “The World is mine, and I have the right to shape it according to what I see as right.” “I know what is right, good and pure, and I must make the world this way.” No, we don’t own the world, and each one of us will be leaving it in the end anyway. It’s time for people to let go of the world and realize they can’t make it please them. The world does not exist to please us. Let us instead work for making the world livable for everyone, no matter how opposed their persuasions seem to ours. What is food to you; may be poison to me. What is a pretty girl to you, may be an ugly girl to me. The point here, is to respect our individual differences. Accept the decision of the Supreme Court. And, move on, with your lives. Those who cannot move on, have only themselves to blame. If they wallow with their thoughts, that Marcos, Sr. is not a hero; and should not be buried in the Libingan ng mga Bayani…so be it ! The world is not made for them…the NARCO Republic of the Philippines is not made for them. We have other serious problems to attend to, other than debating on, whether Marcos Sr. is a hero or not ! People are really stupid ! The distribution of the Hacienda Luisita, to the rightful owners, the tenants, is a priority. The stopping of widespread Shabu Trafficking is also a priority. WHEN WILL THE PRO DUTERTE AND PRO MARCOS STAGE A RALLY? Walang effect na ang mga rally…people have learned their lessons that going to political rallies, benefit political opportunists, like the Aquino Cojuangco , political axis. Fear is the foe of the faddist, but the friend of the fundamentalist. If these people cannot control their emotions, they cannot control their own selves nor their humanity nor their money. The trick is, when there is nothing to do, do nothing. I guess the line from Paul Dabdoub is best told to those people want their brand of justice, good, beauty or what have you obeyed by the world.